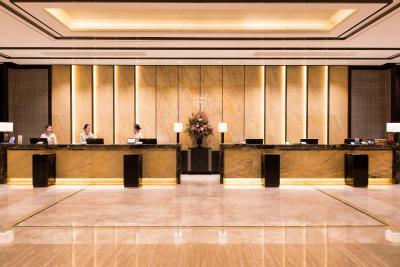 Lock in a great price for Lotte Hotel Busan – rated 8.8 by recent guests! Great location in the middle of the city. Subway and lots of restaurants nearby. We booked a club room which was great. The club lounge served breakfasts, snacks, and a cocktail hour each evening. Super location and facilities!! Staff always kind friendly and helpful. Subway/Metro and good food convenient. Location and convenience. A wide variety for breakfast. Spacious and comfortable room. Everything was excellent! I would not think about choosing any other place to stay. Lotte Hotel Busan This rating is a reflection of how the property compares to the industry standard when it comes to price, facilities and services available. It's based on a self-evaluation by the property. Use this rating to help choose your stay! 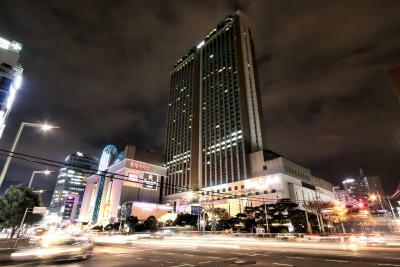 One of our top picks in Busan.Occupying a prime location in Busan, the luxurious Lotte Hotel Busan is just a 5 minutes' walk from Seomyeon Subway Station (Busan Line 1 and 2). 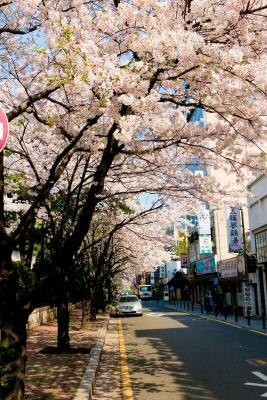 The hotel is directly accessible through underground shopping arcade from Seomyeon Subway Station. 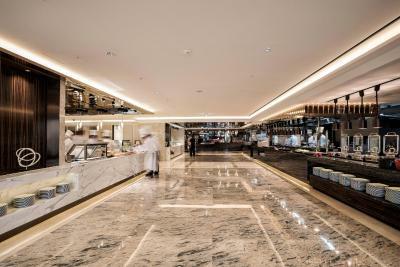 There is an on-site duty-free store selling over 200 luxury brands, department store, and movie theater. Guests may enjoy the indoor and outdoor pool, sauna and fitness center at the Fitness Club. 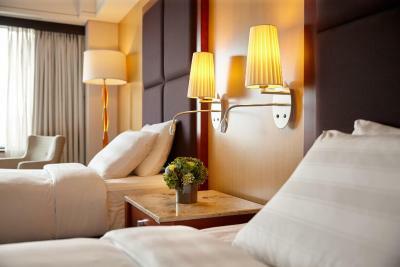 Packed full of modern comforts, the spacious air-conditioned rooms at Busan Lotte Hotel come with free WiFi, goose-down blankets and free toiletries. 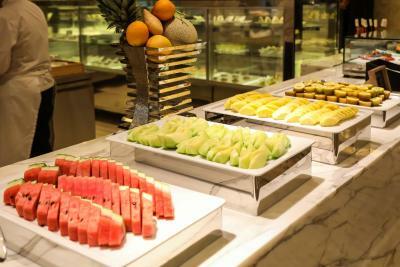 A buffet breakfast is served at LA Seine. 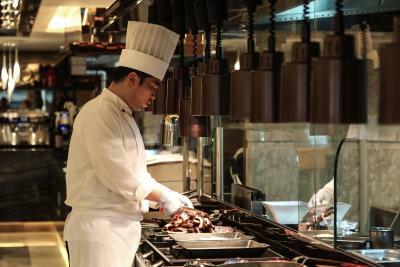 Italian, Japanese, Chinese and Korean cuisines are served at the hotel’s various restaurants. 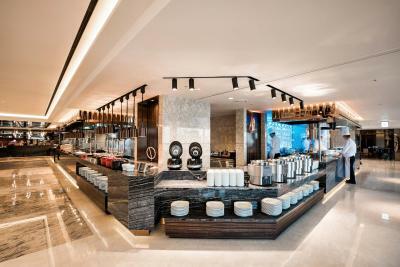 Guests can enjoy dessert and alcoholic beverages at the elegant The Lounge on the ground floor. From Lotte Hotel Busan, Busan KTX Station is a 15-minute drive south and Gimhae International Airport is a 30-minute drive west. Busanjin-Gu is a great choice for travelers interested in shopping, nature and food. This property also has one of the top-rated locations in Busan! Guests are happier about it compared to other properties in the area. 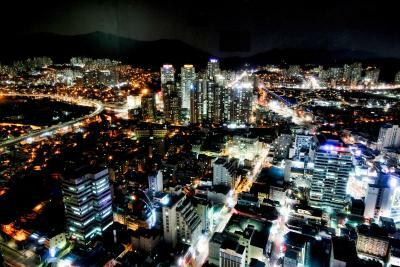 When would you like to stay at Lotte Hotel Busan? This spacious air-conditioned room comes with free bottled water, daily newspapers and a flat-screen TV. The room features sweeping city views. Decorated in bright colors, this room is located on higher levels than deluxe double rooms and offers city views. This room includes one double bed and has no capacity for an extra bed. This spacious air-conditioned room comes with free bottled water, daily newspapers and a flat-screen TV. Deluxe Double with Club Lounge Access is located on levels 31 to 35 and offers free access to Club Lounge. Please note that this room cannot accommodate children under 13 years old. Club Lounge opens from 06:30 - 20:00. Late check-out is available until 15:00. This spacious air-conditioned room comes with free bottled water, daily newspapers and has a flat-screen TV. This room includes two single beds and offers port view. Air-conditioned rooms with city views come with free bottled water, free toiletries, daily newspapers and flat-screen TV. Spacious, air-conditioned rooms with harbor views come with free bottled water, free toiletries, daily newspapers and flat-screen TV. Club Lounge opens from 06:30 till 20:00. Late check-out service is available till 15:00. This twin room features a cable TV, mini-bar and seating area. This room offers access to the on-site swimming pool for up to 2 guests per stay. This elegant and modern double room is finished with carpet flooring and features sweeping city views. Guests staying in this room type has free access to the club lounge from 06:30 until 20:00. 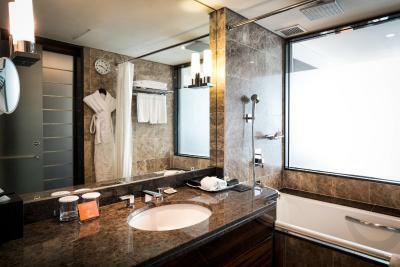 Private bathroom is fitted with both a bath and a shower and comes with free bathing amenities. This twin room features a bathrobe, private entrance and cable TV. Hotel surroundings – This neighborhood is a great choice for travelers interested in shopping, nature and food – Check location Great location - show map Guests loved walking around the neighborhood! 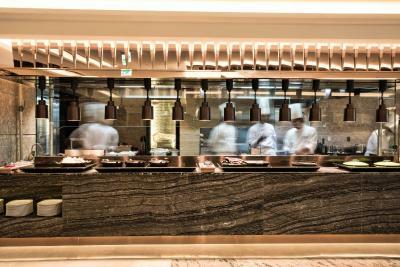 House Rules Lotte Hotel Busan takes special requests – add in the next step! 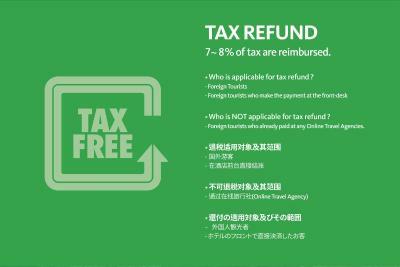 Lotte Hotel Busan accepts these cards and reserves the right to temporarily hold an amount prior to arrival. Guests are required to enter their full name in English when making a reservation. Please note that guests must be at least 14 years of age to use the Club Lounge. Free access to the fitness center, sauna, indoor and outdoor swimming pool is available for 2 guests per night. Additional guests are provided with 50% discount for the entrance into fitness center, sauna and indoor swimming pool. Swimming cap must be worn in the swimming pool. Please note that guests cannot bring floating devices into the swimming pools at Lotte Hotel Busan. Outside swimming pool is open until 16 September. The fitness center is closed every fourth Wednesday of a month. Please note that sauna is available for guests 13 years and older. 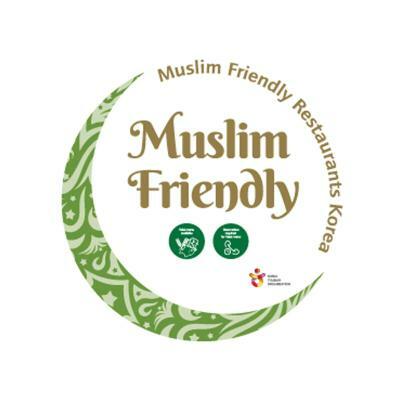 location is perfect, near to local food market and next to lotte department store. many local restaurants and cafe at reachable distance. Outdated hotel. Low value for money. Very old carpet in the corridor and room. Design from 80’s. Ask for a quiet room and end up in front of the housekeeping service door. For a luxury hotel, total lack for of personalized service. Perfect location. Excellent staff, especially the lobby guest service officer and the cleaning ladies. Though room is quite spacious, cannot add extra bed. The location of the hotel is very good, close to shopping mall, restaurants. Not many plugs in the room. Charging our devices was a bit awkward. Breakfast is a bit pricey. Breakfast is good and decent choice, nothing spectacular. Rooms are extremely comfortable and staff are highly professional. Really nice gym too. Some cool streets around the hotel for food and drink. i could feel, this hotel is so old. good location! in downtown, next to department.